They’re no Sam Malone, Al Swearengen or Moe Szyslak. But the two characters behind the bar at the Strip’s newest watering hole have plenty of personality. What they don’t have is names (more on that later). 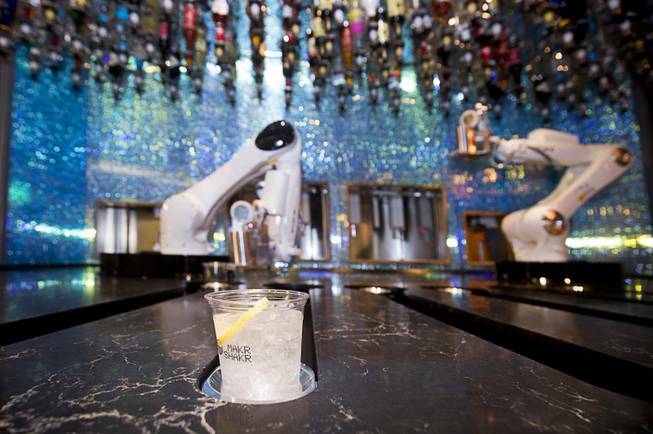 That’s because the featured bartenders at Tipsy Robot, which will open Friday at the Miracle Mile Shops, are indeed robots, even if they don’t get tipsy. 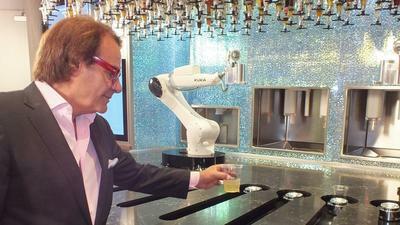 Tipsy Robot is the brainchild of longtime local hospitality professional Rino Armeni, chairman of Robotic Innovations. 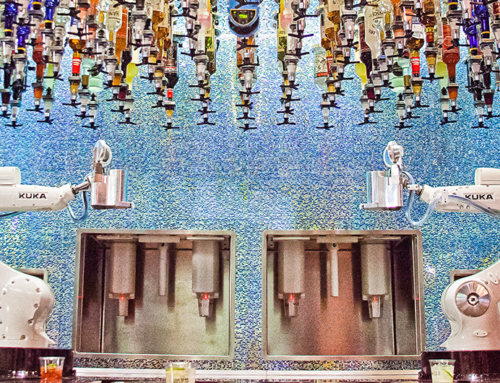 The bar is the only land-based operation of its kind in the world, although there’s one on a Royal Caribbean cruise ship. Here’s how it works: Customers belly up to one of Tipsy Robot’s 33 stations, each complete with blue-painted steel bar stool and permanently mounted electronic tablet. They can scroll through menus of eight classic and 18 signature drinks, all of which can be customized, or can choose a purely custom option. “I think the millennials are going to enjoy doing that,” Armeni said. Each drink is $14, including tax and tip. Customers enter payment information and get a QR code, a type of digital barcode, on their mobile phone. Then one of the robots springs into action. With surprisingly human-like motions, it turns to a nearby compartment to retrieve a cup, which it places in a slot on the bar. 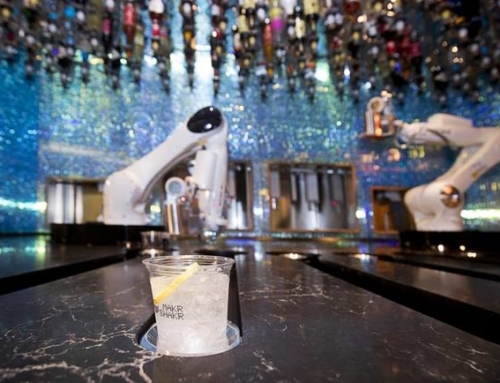 Then the robot moves to another compartment to fill up its “head,” where the drink is mixed, with ice, sugar and mixers, and then the drink is shaken or swirled with motions mimicking a human bartender. The head is equipped with two hatches for the addition of ingredients, and they at times look very much like winking eyes. The robot then reaches for one of the 152 bottles of liquor suspended from the ceiling. A garnish (including some the robot cuts itself) is added, the robot pours the drink into the cup and the cup slides to the front of the slot, to be retrieved by the customer with the use of the QR code. 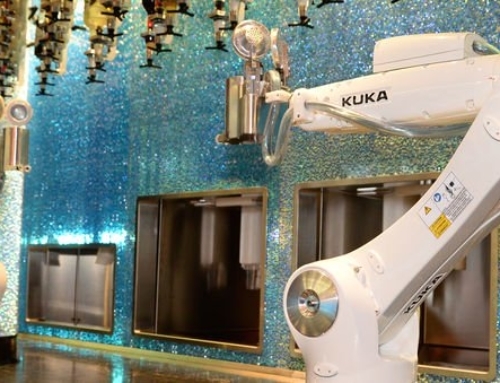 It all takes from 60 to 90 seconds, and between drinks, the robots clean themselves with steam. During initial testing Monday, the robots were a little glitchy, the motion stopping when the robot reached for an empty liquor slot or when a photographer’s lens crossed the invisible safety barrier that shuts down the system should an overly curious or tipsy human try to get too close. Representatives of the Italian software manufacturer (the robots themselves are made by a German firm) were on site, and Armeni was sanguine about the Friday opening. “When you plug in a new system, sometimes it takes a while for the two parts to understand each other,” he said. Interest on the part of the public clearly was building Monday. 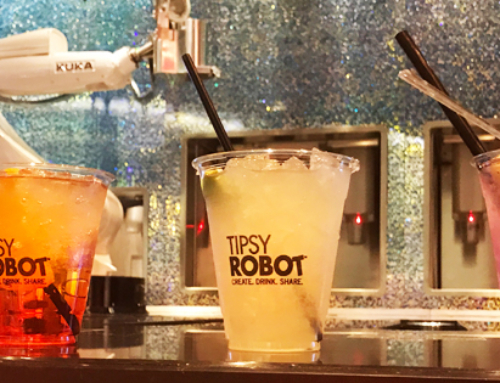 The bar’s front and side entrances near Cabo Wabo Cantina have mesh curtains and passers-by clustered around them to talk to Tipsy Robot’s silver-clad “galactic ambassadors,” who will assist customers with ordering and occasionally serve drinks. “People are very curious and excited,” general manager Danielle Galindo said. Galindo’s staff of 12 includes human bartenders, who will serve craft beers, Champagne and mimosas at a bar along Tipsy Robot’s front corner. Plans are to also have a mimosa and bloody mary cart on weekends. “And they get the free show with the robots,” Armeni said. It is indeed a show. Between their mixologist duties the robots occasionally dance in unison, with motions that somehow manage to evoke The Rockettes. A video screen above them provides robot trivia (“The first robot was a steam-powered pigeon in Greece, circa 400-350 BC”) and a trivia quiz. 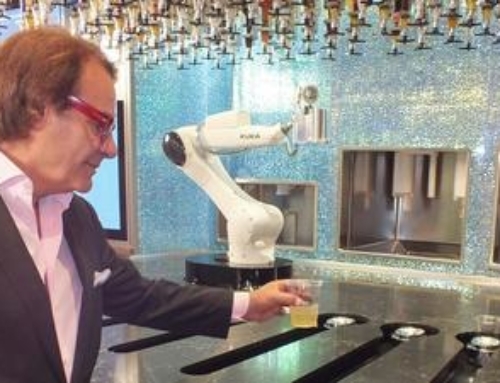 More Tipsy Robot locations may be in the works; Armeni has worldwide rights to land-based operations, while Royal Caribbean has the water-based rights. Oh, and back to those poor anonymous robots: They won’t toil in anonymity for long, because Armeni plans a contest to name them.